Smith's Crossing 4 BR with great floor plan! Front room den on main floor, 1/2 bath, laundry and open great room with gas-burning fireplace. 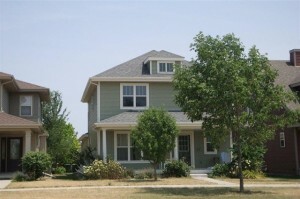 Upstairs features 4 bedrooms; master suite with walk-in closet and private master bath. Move in ready, neutral colors, laminate wood flooring. Kitchen offers gas stove, stainless steel appliances, breakfast bar, pantry. Love the low-maintenance small yard with huge green space out front for lots of play. Great opportunity to finish lower level. 1-yr warranty included. 4 BR, 2.5 BA, 2032 Sq. Ft. This innovative Sun Prairie neighborhood is a unique combination of old-fashioned and newer touches. Smith's Crossing takes wise ideas including wider sidewalks, narrower streets, lots of green spaces, and plenty of community gathering places and adds convenient neighborhood shopping and dining, and diverse homesites suited for today's wide array of housing options.